Zourman Drums introduces models with Virtual Clutch functionality – a just great idea which was initiated from a user! Virtual Clutch is a system where the hi-hat pedal position can be set in advance dynamically between open/closed mode. Just a perfect solution for drummers with double kicks who sometimes need the ability to set the hi-hat pedal in to near closed position – just as a real hi-hat. A switch on the front panel will set the Zourman hi-hat module in virtual clutch mode. A potentiometer adjusts the hi-hat position between open or closed. One feature is that the pedal will still work as usual when in virtual clutch mode, but then will go from the fixed position to closed when pressing down the hi-hat pedal. The new added virtual clutch models includes support for Roland FD-7, FD/8, FD-9, VH-11 and VH-12 hi-hats and the 2box DrumIt Five module. 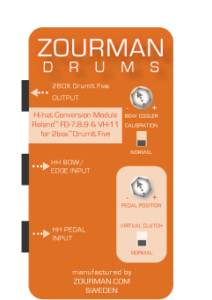 The virtual clutch functionality is offered on new separate models of the Zourman Drums hi-hat conversion module. ‹ Zourman Drums ready for the road!